Ever since I was little I loved waking up on Thanksgiving morning because it meant that there was obviously no school, my parents had the day off from work which meant my dad would be making me food, and I could sit by the fire and watch the parade. As I grew up that excitement remained the same but took on more importance as it meant I was coming home from college and could catch up on both sleep and missed memories with friends and family. 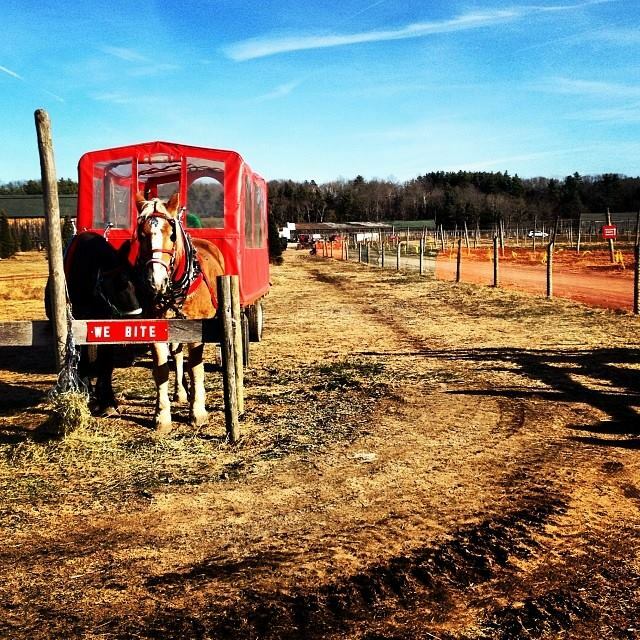 Our ride at the tree farm! This year, however, was the first time that I was experiencing a family based holiday without my parents. When the majority of students were being picked up by family and friends- I was packing a bag to drive to my cousin’s house to experience a different idea of the holiday than I was accustomed to. I would be lying if I said I was not nervous of what to expect or anxious knowing that I had not seen my parents since August and wouldn’t until Christmas. When Thanksgiving did roll around I was pleasantly surprised that I was not entirely homesick without the comforts of home and actually found myself enjoying the day with my aunt and her family. The day started off with a trip to the park to feed the swans and ended with a trip to a Christmas light exhibit that I have always gone to since I was little. The rest of the week included visits with high school friends, lots of small town charm, and a trip to the tree farm to pick out my cousin’s Christmas tree. Although it was strange to return to where I am from without staying in my childhood home it was great to see my cousins and to be able to order a “grinder” and have people understand that it means sub. Yes, it was hard setting the table for seven people instead of nine but I realized that no matter how hard we try to hold on to childhood memories or traditions- families grow up and in my case that means they move to Texas. Growing up may mean that you are unable to wake up in your childhood home and sit by the fire with your family pet but it also means that you can find comfort in the memories and the hope that one day you will establish your own traditions.